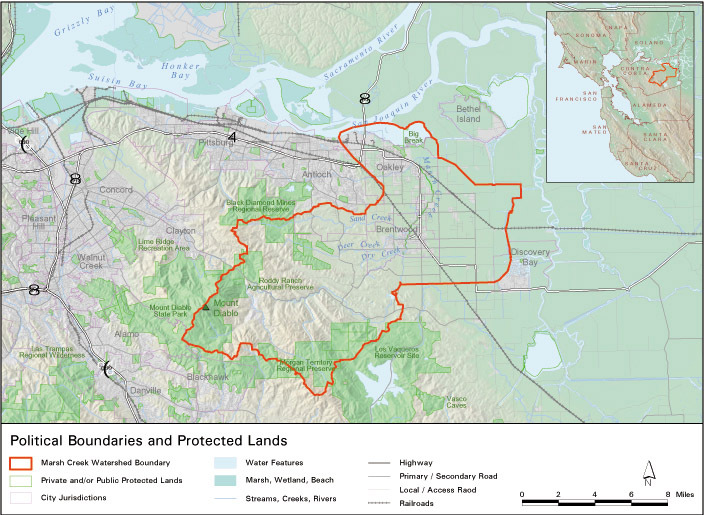 Located in Contra Costa County, the Marsh Creek watershed is quickly urbanizing due to the rapid growth of several communities. 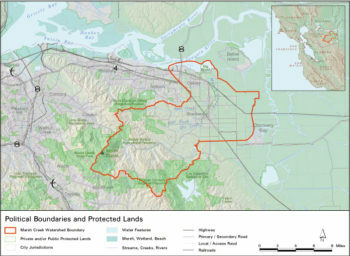 The headwaters of Marsh Creek is located on the eastern side of Mount Diablo, and the creek then runs 30 miles through the communities of Oakley, Brentwood, and Antioch before reaching its mouth at the western side of the Sacramento-San Joaquin Delta, northeast of Oakley. The Marsh Creek Reservoir, created in the 1960s by damming a section of the creek, helps regulate the flow and provide flood protection of Marsh Creek through developed areas. The lower portion of Marsh Creek (below Marsh Creek Reservoir) was channelized in the 1950s and 1960s to help control flooding in this agricultural area. Due to its unique connection between the Diablo Range and the Sacramento-San Joaquin Basin, Marsh Creek is considered a priority watershed for habitat restoration for spawning salmon. In 2010, an American Rivers-led partnership built a fish ladder on Marsh Creek to enable Chinook salmon to pass a 6-foot high dam and access 7 miles of upstream spawning habitat. Marsh Creek is the first tributary encountered by salmon returning from the ocean through the Sacramento-San Joaquin Delta, thus Salmon spawned in Marsh Creek will enter the Delta in a prime location: adjacent to Dutch Slough, one of the largest habitat restoration projects in the Delta and downstream from most Delta diversions and other mortality sources. Marsh Creek runs through communities that are rapidly growing in population and development, which presents a unique opportunity for outreach and education on the watershed. 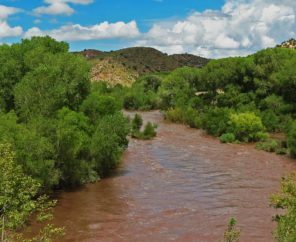 Friends of Marsh Creek Watershed (FOMCW) is a community organization that has programs and projects in the fields of water quality monitoring, outreach, advocacy and stewardship, education, restoration, and community service. FOMCW is currently working in partnership with Contra Costa County Flood Control and Water Conservation District on restoring 10 acres of wetland in the basin. The East Bay Regional Park District Manages the 6.5-mile Marsh Creek Regional Trail, which provides community members with hiking and biking opportunities along Marsh Creek. The trail will eventually be 14 miles long and will connect the Delta with Morgan Territory Regional Preserve and Round Valley Regional Park.